As we head towards this weekend's Little Big Show #20 with Pickwick and Porter Ray, we're looking back at previous editions of this concert series hosted by KEXP, Starbucks, and STG Presents. (Look back at Shows 1-5 here, and stay tuned as we continue our retrospective on the KEXP Blog all week long.) Tickets for Saturday's show are on sale here; proceeds benefit Urban Artworks. My Morning Jacket lead vocalist Jim James stopped through in support of his debut solo album, Regions of Light and Sound of God, alongside Canadian "doom-soul" songwriter Cold Specks. Both acts brought spectacle to the Neptune, with James reveling in the energy of the evening as he danced across the stage adorned by a killer light show. Proceeds from the show went to benefit KEXP's next door neighbors The Vera Project, a non-profit, all-ages youth arts organization that hosts shows and classes for local artists. 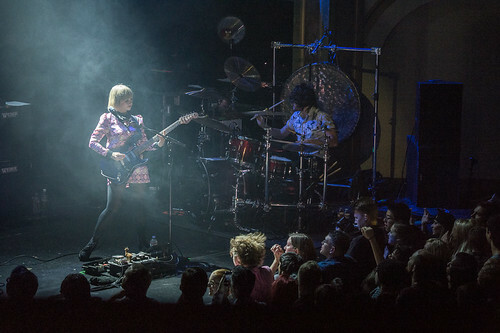 Every time The Joy Formidable takes the stage, it's going to be electric. 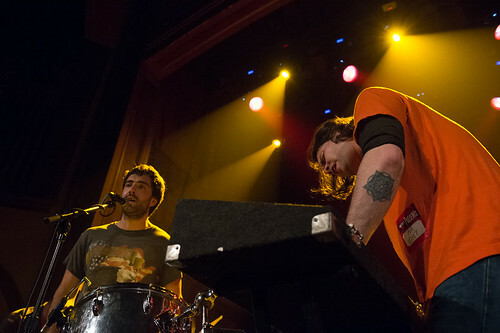 Their performance at Little Big Show was no exception, heightened even with an opening set by Seattle experimental rock outfit Feral Children. The show benefited Seattle Music Partners, an organization providing a free after-school music program for elementary school students who are being under-served in the Central District of Seattle. Washed Out piled on the hazy layers of synthesizers and reverb-drenched guitars when they headlined Little Big Show alongside Kingdom Crumb and Kisses. It was the perfect cinematic setting for an evening benefiting Reel Grrls, an organization that helps empower young women from diverse communities to cultivate their voice through media production. A Cloud Cult show isn't just about the music; it's a visual experience as painters create right alongside the band. Bringing these multimedia experience to Little Big Show alongside local favorite Benjamin Verdoes offered up a moving evening of art. The show's beneficiary, Hugo House, also helped include writing and literature into the fold to help cover arts on an even broader scale. Local hero Ben Gibbard of Death Cab For Cutie gave a rare solo performance for Little Big Show, playing material from the DCFC a well as his own solo work and even a cover of ALVVAYS' "Marry Me, Archie." Cataldo's Eric Anderson also gave his band the night off as he delivered a poignant set of acoustic tunes. Proceeds from the evening went to ArtsFund, which distributes arts grants and resources to non-profit arts groups throughout the region. The 11th installment of Little Big Show gave some of the most soulful moments in the series so far. Both St. Paul & The Broken Bones and Shaprece dazzled the crowd with fluttering arrangements and spirited howls. There was a lot to celebrate too, as ticket sales went to local non-profit Rain City Rock Camp for Girls, an organization encouraging girls to express themselves through music and giving them the tools to do so.